It was Sarah Chauncey Woolsey’s birthday a couple of weeks ago. She is probably better known as Susan Coolidge, the author who wrote the books about Katy and her siblings. As I wrote a short post about her, I couldn’t resist looking through some of her books. In “What Katy Did”, they have a Valentine party — I did remember that, but I didn’t remember that they it was held on “Valentine Eve”. 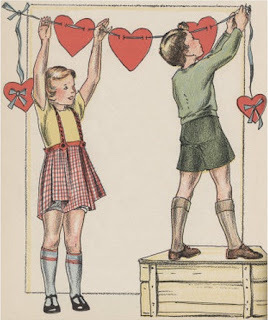 Thinking of it, I can’t recall that I ever heard, or read, about celebrating Valentine on any other day than the 14th . Valentine's-Day was the next Friday. When the children came home from school on Thursday afternoon, Aunt Izzie met them, and, to their great surprise, told them that Cecy was come to drink tea, and they must all go up stairs and be made nice. "But Cecy comes most every day," remarked Dorry, who didn't see the connection between this fact and having his face washed. "Yes—but to-night you are to take tea in Katy's room," said Aunt Izzie; "here are the invitations: one for each of you." Sure enough, there was a neat little note for each, requesting the pleasure of their company at "Queen Katharine's Palace," that afternoon, at six o'clock. This put quite a different aspect on the affair. The children scampered up stairs, and pretty soon, all nicely brushed and washed, they were knocking formally at the door of the "Palace." How fine it sounded! The room looked bright and inviting. Katy, in her chair, sat close to the fire, Cecy was beside her, and there was a round table all set out with a white cloth and mugs of milk and biscuit, and strawberry-Jam and doughnuts. In the middle was a loaf of frosted cake. There was something on the icing which looked like pink letters, and Clover, leaning forward, read aloud, "St. Valentine." "What's that for?" asked Dorry. "Why, you know this is St. Valentine's-Eve," replied Katy. "Debbie remembered it, I guess, so she put that on." Nothing more was said about St. Valentine just then. But when the last pink letter of his name had been eaten, and the supper had been cleared away, suddenly, as the children sat by the fire, there was a loud rap at the door. "Who can that be?" said Katy; "please see, Clover!" So Clover opened the door. There stood Bridget, trying very hard not to laugh, and holding a letter in her hand. "It's a note as has come for you, Miss Clover," she said. "For me!" cried Clover, much amazed. Then she shut the door, and brought the note to the table. And I stick to Clover." This was the first valentine Clover had ever had. She was perfectly enchanted. "Oh, who do you suppose sent it?" she cried. But before anybody could answer, there came another loud knock at the door, which made them all jump. Behold, Bridget again, with a second letter! "It's for you, Miss Elsie, this time," she said with a grin. And her name begins with E, and ends with E.
"Do you ask me why I love her? This little girl whose name begins and ends with 'E.'" "It's just like a fairy story," said Elsie, whose eyes had grown as big as saucers from surprise, while these verses were being read aloud by Cecy. Another knock. This time there was a perfect handful of letters. Everybody had one. Katy, to her great surprise, had two. "Why, what can this be?" she said. But when she peeped into the second one, she saw Cousin Helen's handwriting, and she put it into her pocket, till the valentines should be read. Dorry's was opened first. It had the picture of a pie at the top—I ought to explain that Dorry had lately been having a siege with the dentist. And he began loudly to cry. Which belied her question mild. Jumps and aches and is loose, O my! He had all his teeth pulled by a dentist!" Any more, as you used to do. Away in the woods to hide. Nor seen the wolf at all. You shall see for yourself I'm not." Johnnie was immensely pleased at this, for Red Riding-Hood was a great favorite of hers. But I chewed them up instead. All but this little bit. And beg we may be friends. And store it with honey sweet and good. "I think that's the prettiest of all," said Clover. "I don't," said Elsie. "I think mine is the prettiest. Cecy didn't have any seal in hers, either." And she fondled the little seal, which all this time she had held in her hand. "Katy, you ought to have read yours first because you are the oldest," said Clover. Sugar is sweet, and so are you." "What a mean valentine!" cried Elsie, with flashing eyes. "It's a real shame, Katy! You ought to have had the best of all." Katy could hardly keep from laughing. The fact was that the verses for the others had taken so long, that no time had been left for writing a valentine to herself. So, thinking it would excite suspicion to have none, she had scribbled this old rhyme at the last moment. "It isn't very nice," she said, trying to look as pensive as she could, "but never mind." "It's a shame!" repeated Elsie, petting her very hard to make up for the injustice. Wishing you a happy Valentine's Day too - with plenty of chocolate and love! !